…in dry, hot years like 2018, owners of Elkhead water were glad to have the backup. “The reservoir served a good purpose for multiple reasons in Moffat County,” said Jim Pokrandt, director of community affairs for the Colorado River District. Both the Upper Colorado River Endangered Fish Recovery Program and Tri-State Generation & Transmission had to call on their water stored at Elkhead this year. They are among four major owners of water in the reservoir, which also includes the city of Craig and the river district. The city drew ample water from the Yampa and didn’t need Elkhead water this year. The Fish Recovery Program owns 5,000 acre-feet of water, which it procured when the reservoir was expanded in 2006 in exchange for a $13.5 million contribution to the project. An acre-foot is enough to cover one acre, about the size of a football field, with one foot of water, or about 326,000 gallons. The Recovery Program utilized every drop of its 7,000 acre-feet, releasing water into the Yampa beginning in late July — unusually early — and continuing until October. With the prolonged summer drought, Yampa flows dropped to a precipitously low 38 cubic feet per second by early October in Maybell, where the United States Geological Survey operates a stream gauge. The Maybell gauge is used to determine how much water is making it downriver and how much to release from Elkhead. For comparison, the Recovery Program ordinarily aims to keep flows at 93 cfs or greater, Anderson said. When river flows dropped too low this year, Tri-State called on its water in both Elkhead and Stagecoach reservoirs to keep the plant operational. From Elkhead, it used 341 acre-feet of water, according to the River District, though it owns much more. Tri-State secured 2,500 acre-feet of water when the reservoir was expanded, plus it owns a portion of an 8,408 acre-foot pool shared by owners of Craig Station Units 1 and 2. 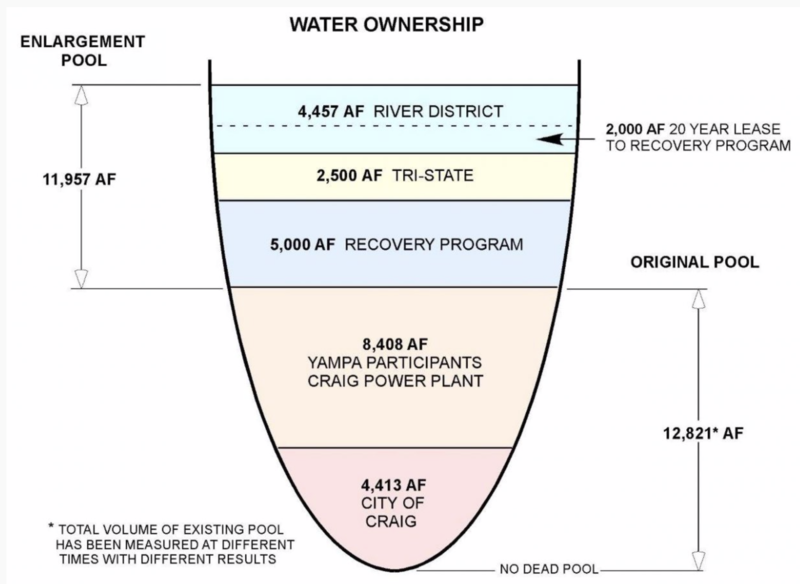 Additionally, Tri-state owns 4,000 acre-feet of storage in Yamcolo Reservoir and 7,000 acre-feet in Stagecoach, according to the 2004 Yampa River Basin report. Tri-state would not divulge how much water it used from Stagecoach this year. According to historical data provided in the 2004 report, however, Craig Station’s annual water use averaged more than 11,000 acre-feet per year between 1985 and 1991. Again, Tri-state declined to provide more recent data. Decisions about how much water to release out of Elkhead are evaluated in a weekly phone call between the reservoir’s partners and users, state officials, meteorologists, irrigators, and other stakeholders, all led by Anderson. Water levels in the reservoir dropped slightly lower than average this year, down to 12 feet instead of 14 — revealing more shoreline than some are used to seeing — but recreational use of the reservoir by fisherman and boaters wasn’t significantly affected. 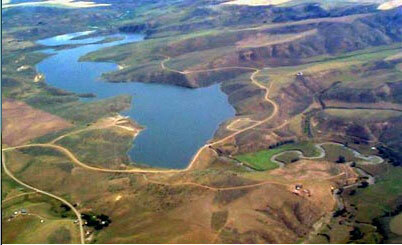 The reservoir collects water from a 205-square-mile basin and reliably recharges with spring runoff each year. Water managers worry about what would happen if drought persisted for several years, but so far, Elkhead has offered a measure of security to Moffat County’s biggest water users.